Caring for our environment is becoming more and more important every day, and with Earth Day just around the corner, we have a perfect chance to integrate some environmental consciousness into our learning. Today’s students are very aware of environmental issues, and they welcome the opportunity to consider what role they can play in saving the earth. Whatever your subject focus, you can take some time this month to explore what actions we, as individuals, can take towards sustainability. In my music classes we will sing some environmental songs as a starting point. In Kindergarten, for example, we will sing an edited version of Ben Harper’s (and Jack Johnson’s) “With My Own Two Hands”, and we will break it down to categorize and analyze the lyrics. Then we will discuss what real actions we can take to live out the message. This kind of inquiry isn’t limited to Music! It connects to Language Arts, Social Science, and Natural Science as well. Pre-Kindergarten classes might engage in some simple songwriting, where they just fill in some key words or phrases in a song that is mostly prepared for them. Older students can dig deeper into the lyrics, making connections to systemic problems, social structures, and world views that might contribute to a problem. This kind of thinking not only creates awareness of the greater complexities with the problem, but can prompt thinking and action for steps toward solutions. With my fifth graders, I have gone as far as to ask them to think about why—when so many people know that we need to “save the environment”—these problems continue. How does a minority view win? The students have been trying to read between the lines and look for references in the song lyrics as well, which has really drawn them in! It’s been my experience that students are sometimes so engaged with these relevant conversations that I have to dump my other plans to follow through—genuine inquiry in action! I’m hoping to gather our school community to share some environmental songs during break time or lunch. I may ask classroom teachers if I can come and sing songs with their classes as a prompt for further study in the classrooms. In the past, I’ve done a lot of song analysis with my classes, as well as songwriting in response to environmental quotes. I find that quotes are an interesting way to get children thinking about different views, about language, and about social issues. The way we interpret and contextualize them really lends itself to developing critical thinking skills! 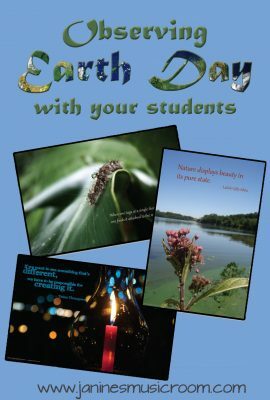 If you want to try it, have a look at my Earth Day poster and activity set, which has set quotations (related to the environment, but also to social action in general) on beautiful photos. The teaching packet also includes some transdisciplinary ideas for how you might use the posters and quotes to stimulate critical thinking, inquiry and action. How do you recognize Earth Day in your classes?